Sometimes when I interview people for this blog, I get so immersed in their stories that I forget to think about what recipe I want them to share with me. That happened again a few weeks ago, when I was sipping chai with Punjab Palace owner Parmjit Singh and he asked me what I wanted to cook. I couldn’t think of anything fast enough, so he got up from his chair and told me to follow him into the kitchen. 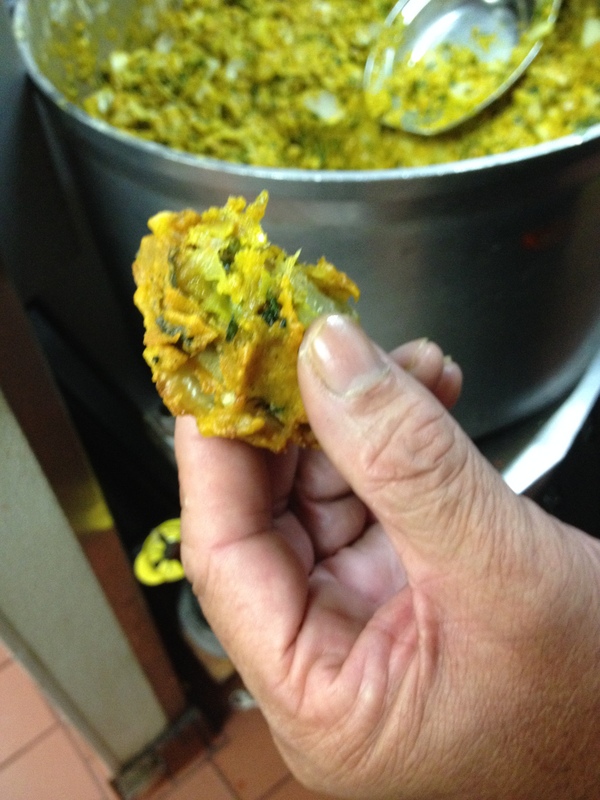 The moment I walked in and smelled the pakoras frying, I knew what I wanted. But for you to understand the significance of the event (and the lack of measurements in the recipe below), you have to get to know Parmjit’s style. Parmjit Singh came to Boston from India more than 30 years ago and, like many immigrants, took a job as a dishwasher. Sounds clichéd, but it’s true. He worked at an Indian restaurant where, as you might imagine, the quality of the food did not live up to what he used to eat back at home, in the Punjab region of India. So in 1983 Parmjit opened India Quality in Kenmore Square. The idea was to avoid buffets, and to make everything with fresh ingredients, from scratch, and with the exact same spices he used at home – even if that meant having to travel to India to buy them himself. The restaurant has been a resounding success, a testament to the quality of the food and… what else? India Quality is Zagat-rated, ranked best Indian restaurant in Boston for more than 10 consecutive years. Parmjit knows what he’s doing. 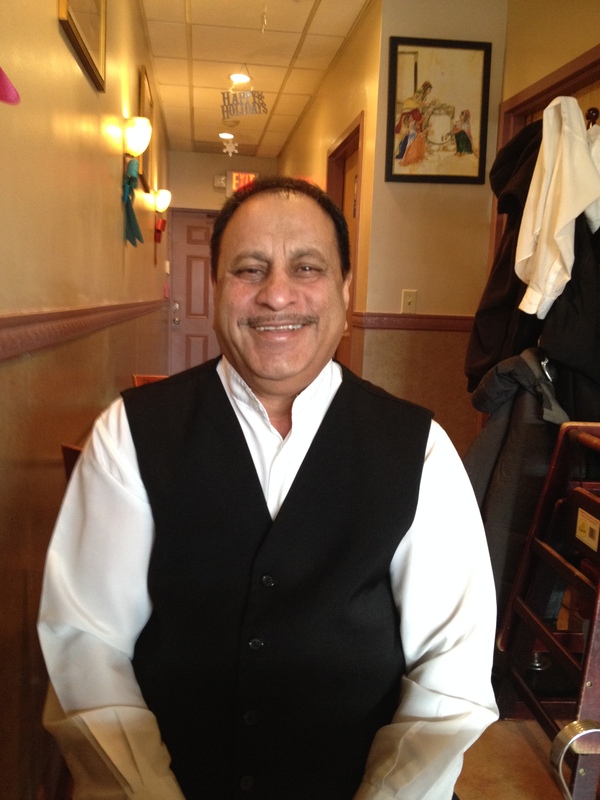 In 2007 he opened Punjab Palace in Allston, a restaurant with a similar menu and disposition to its sister in Kenmore. He employs 10 to 12 people in each restaurant, and all his cooks started out as dishwashers. Training his own cooks gets Parmjit two things: staff loyalty and dishes made exactly up to his standards. And while over the decades many employees have left him to start their own restaurants, as Parmjit once did himself, he doesn’t mind it. He says the secret to his success is using fresh ingredients and perfecting his masalas with fastidious determination. Unlike with most restaurants, ingredients don’t get delivered at Punjab Palace. Parmjit drives to Chelsea a few times a week to select the stuff himself. I see. But I don’t think that’s quite the secret. We keep talking. He tells me about his spices, all of which he grinds and mixes himself. Now the conversation gets serious. Spices are no joke to any Indian cook, but Parmjit is on a different level. He makes no fewer than two yearly trips to India to bring back some of the flavors he cannot find in the United States. I ask him where he learned to cook. He says all his recipes are family recipes. Despite that, he creates new dishes all the time. When he said that, I thought to myself, maybe that is the secret to his success. And then, out of the blue, he tells me the following story. About 15 years ago a man came by his restaurant who said was from Jaipur and a descendent of the Moghuls (note to unfamiliar readers: Mughlai cuisine is a style of cooking developed in the imperial kitchens of the Mughal Empire back in the day. In other words, it’s good stuff.) The man invited Parmjit to come visit him in India. Parmjit went and spent a few days cooking with the man’s family and writing down recipes. When he came back and tried to recreate the dishes, he couldn’t. It took many tries to get the spices and flavors right. “Some things I had to make 20 times before I was happy with the result,” Parmjit explains. And perseverance, I realized, is the secret to his success. In fact, perseverance is the secret not only to Indian, but to all cooking. At that point he invited me into Punjab Palace’s kitchen. I, giddy with excitement and gloating, walked into the kitchen and much to my delight found a large batch of pakoras frying away. Parmjit must have seen the love in my eyes. He put a few of the fritters on a dish and gave me a tour of the kitchen. When we came out, he poured me some more chai and brought out the condiments. 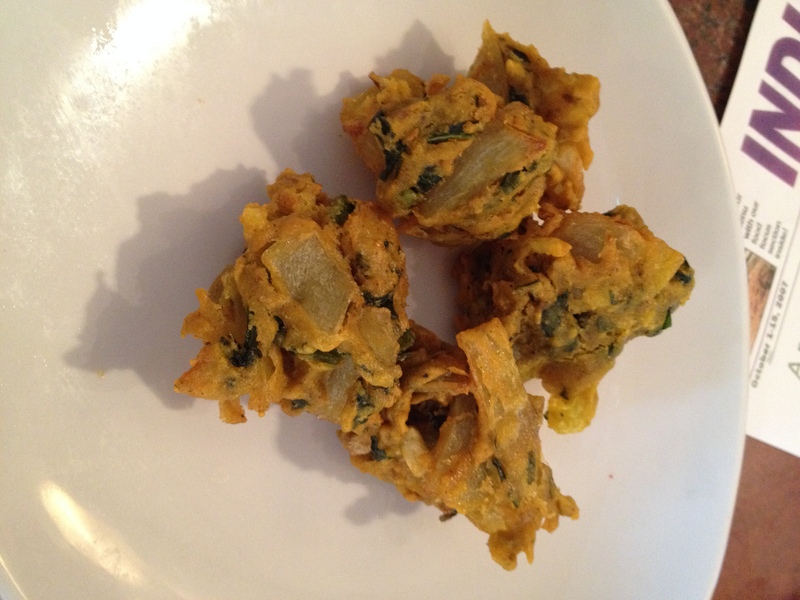 As I savored the crispy and delicious pakoras, Parmjit explained how they’re made, exactly as listed below. Yes, you’re going to have to play with the measurements. Trial and error. Indian perseverance. “Won’t you teach me how to make this onion chutney,” I said, pointing at the jar of glistening red relish on the table. All right, you’ll have to go to Punjab Palace for the full experience. Chop all vegetables in small pieces of similar size and mix together in a large bowl. 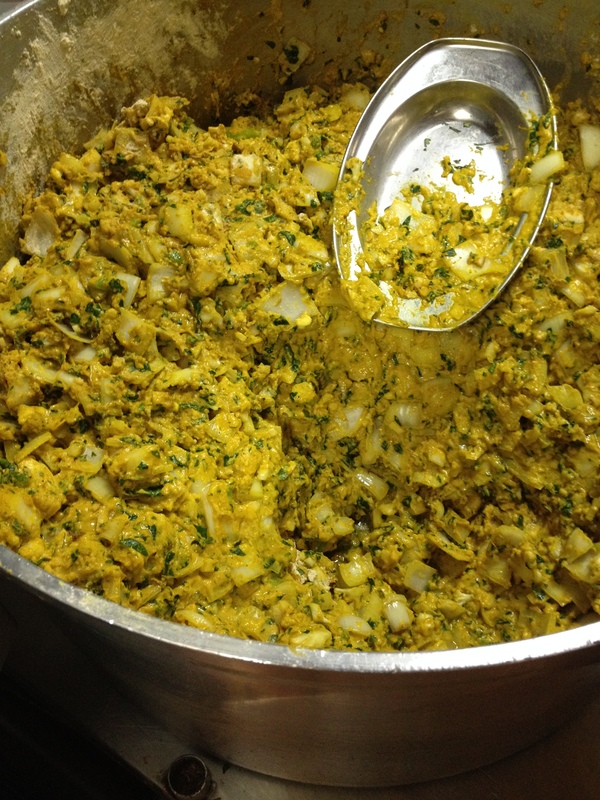 Add salt, spices, yoghurt, and chickpea flower and combine well. The result should be a sticky batter that keeps all ingredients together. (See picture above.) Don’t add water. It shouldn’t be runny. Deep fry in vegetable oil until golden brown. 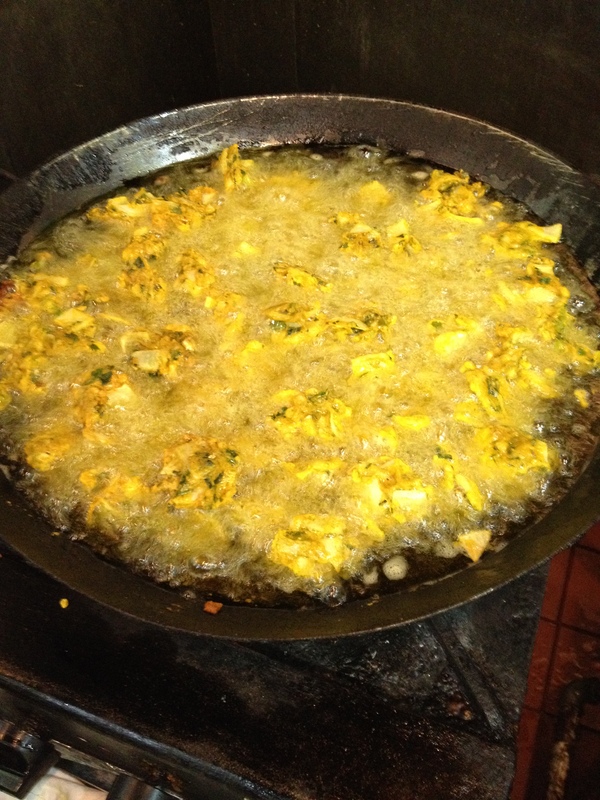 If the oil is too hot, the pakoras will burn on the outside and stay raw inside. If the oil is too cold, they’ll be soggy and not good. Get the oil temperature right! Serve with chutney of your choice. I like onion, cilantro and tamarind chutneys. One of my favorite spots in Allston – well done.